Vladimir Putin says personal relationships with all world leaders are important, but tellingly singled out several politicians with whom he drops official titles. 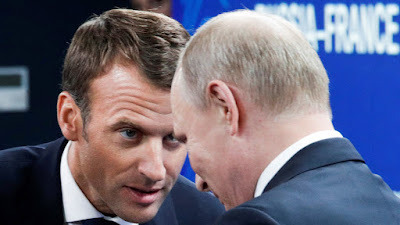 Noting that, of course, English has no such distinction, the Russian president did say that in other languages such as French (which has 'tu' and 'vous') and German (with 'du' and 'Sie') such subtleties can turn deferential negotiation into a friendly chat. And who does he use the informal addresses with? “With the Prime Minister of Japan [Shinzo Abe] we use first names and the informal ‘you’ and also with the Chancellor of Germany,” said the Russian President, which is perhaps not surprising, as both Putin and Angela Merkel are two of Europe’s longest-serving leaders, and spent a significant part of their lives in East Germany. More surprisingly, Putin said that he deploys informal terms when talking to Emmanuel Macron, despite what must have been several tense conversations over sanctions and Syria in the past year. Perhaps this is a reflection of Macron’s pally demeanor, particularly on display during his recent meeting with Donald Trump. In contrast to the somewhat stiff and menacing portrayal he is assigned with by the Western media, more broadly Putin sang praises to the value of bonhomie. “I try to be on first-name terms with many – almost all – politicians. This in my view is very important – at this level a mutual respect has to exist in all circumstances, and a personal relationship can become a tool for solving international issues,” said the Russian President. But there is one friend of Russia that Putin would never use the 'ty' form with: Milos Zeman, the 73-year-old President of the Czech Republic. “I always use the polite form with him. He is, after all, a little older than me,” explained Putin, 65.